Guillem Balague has suggested that Real Madrid are willing to pay €80m+ for Chelsea ace Eden Hazard, and that they could have an agreement with him already. As noted by The Sun, speculation linking Hazard with a move to Real Madrid is seemingly never ending as rumours continue to suggest that he could make the switch this summer. The 28-year-old is having another great season with 19 goals and 12 assists in 43 appearances across all competitions, but there are concerns from a Chelsea perspective as to whether or not this could be his last year at Stamford Bridge. 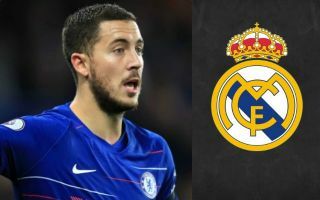 As seen in the video below, Balague has suggested that Real Madrid believe €100m will seal the deal to sign Hazard this summer, but they would prefer to negotiate that price-tag down to something around the €80m-€90m mark. More interestingly though, he goes on to add that a ‘private agreement’ could exist between the Spanish giants and the player himself to make the move to the Bernabeu, and so that would suggest that all that is missing is an agreement between the two clubs to green light the transfer. That is of course a very big obstacle to overcome still as Chelsea will not want to lose their talisman for any fee, but given he has just a year remaining on his current contract, if a new deal isn’t signed, they may well have to start listening to offers especially if it’s in excess of €80m as suggested by Balague.